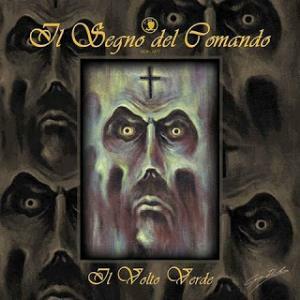 The music of Il Segno Del Comando isn't the typical Italian progressive rock that most prog heads like to listen to. They didn't copy the music of the famous Italian prog rock acts like Premiata Forneria Marconi (PFM), Banco Del Mutuo Soccorso or Le Orme. This band from Genoa started in 1995 as a studio project with the aim of reproducing the sound and the atmosphere of bands from the seventies like Goblin, Il Balletto Di Bronzo or Jacula. Their eponymous album (1996) was inspired by the novel of the same name by the Italian writer Giuseppe D'Agata followed in 2001 by Der Golem, which was inspired by a novel of the Austrian writer Gustav Meyrink. After a hiatus of twelve years the band recorded Il Volto Verde (the green face) in 2013. The new album was recorded with a renewed line-up featuring founder member and main composer Diego Banchero (bass, keyboards, Theremin), Giorgio Cesare Neri (guitars), Maethelyiah (lead and backing vocals), Fernando Cherchi (drums, percussion), Maurizio Pustianaz (keyboards), Roberto Lucanato (guitars) and Davide Bruzzi (guitars). As was to be expected this third record is again a concept inspired by Il Volto Verde, another novel by Gustav Meyrink. This novel was written in 1916 and is set in a surreal post-World War I Amsterdam. It's pervaded by a strong sense of mysticism and spirituality. The book also describes some techniques related to mind control and mental emptiness. To make this story even more impressive the band selected a number of guest musicians to participate. Many of them have a connection to the style of music that can be found on the first two efforts. Amongst them are Claudio Simonetti (Goblin, keyboards), Gianni Leone (Balletto Di Bronzo, keyboards), Martin Grice (Delirium, sax, flute), Freddy Delirio ( Death SS, keyboards) and Sophya Baccini (Presence, vocals). Well, this led to an excellent result since the music and the lyrics perfectly fit this concept. However, I'm afraid that it's almost impossible to fully appreciate this complex work without having read the book. Right from the start it's obvious that both the music and the story are rather complex. However, the level of compositions throughout the album is rather high, but I still have some favourites. These are most of all the more keyboard orientated pieces such as the first track Echi Dall'Ignoto on which you'll only hear the keyboards of Freddy Delirio. On L'Evocazione Di Eva you'll hear the dominant role of Claudio Simonetti playing excellent parts on the Moog, Mellotron and the organ. For people who want musical references I would like to refer to all the above-mentioned acts beside bands such as Antonius Rex, Magma and King Crimson. I have to say something about the artwork on the cover and in the booklet as well. It very well corresponds with the music and the story of the album. The evocative cover artwork features an impressive and shocking painting from the artist Danilo Capua. Inside the booklet many pictures can be found that were possibly taken during the time this imaginary story took place! To appreciate the music you have to play Il Volto Verde a number of times, and even by doing so you must have an open mind to fully understand what happens on this almost one-hour album. People who like their music soft and easy won't like this album for sure, but if you have the courage and the time to discover the beauty of it you'll hear in the initially chaotic sounding music some very beautiful prog rock passages with elements taken from space rock, opera, gothic, metal and zeuhl. However, it won't be embraced by all devotees of progressive rock. Il Volto Verde is most of all an album that will be cherished by only few people. I can only challenge prog heads to listen to the music and become one of the happy few just like myself!